The XS-62S is a compact 1U rack mount, compact 6-channel video switcher with audio mixer and PTZ camera control capabilities for both permanent installs and on-site events. The XS-62S is a compact 1U rack mount, compact 6-channel video switcher with audio mixer and PTZ camera control capabilities for both permanent installs and on-site events. This powerful, integrated solution supports a wide range of applications including presentation and performance and special event venues, corporate AV conferences, classrooms for e-learning and more. The XS-62S is a great space saving unit that is easy to control from the front panel buttons and menu screen, or from a PC or Mac using realtime remote control software (RCS). Content creation is a challenge for many companies looking to more efficiently produce product presentations, town hall meetings, and trainings. The XS-62S makes it easy to create content with an all-in-one switching and audio mixing system that streamlines the production process. The XS-62S is easy to use from either the front panel controls or remote control software from a PC or Mac. Programmable presets allow one-touch recall of preset camera positions and angles, and the audio auto mixer takes care of audio mixing in the background, so the operator can focus on switching video. The XS-62S is the perfect size for installation into small spaces and portable enough to be used in multiple areas of a corporate office or other facility. XS-62S is the ideal solution for hotel meeting rooms and banquet halls, houses of worship and live performance venues. 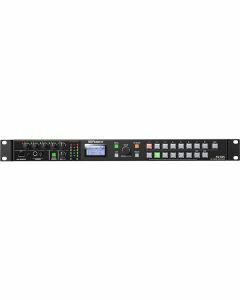 The XS-62S Matrix Mode makes it easy to send different content to 2 to 3 screen destinations, from a single switcher all while mixing program audio and controlling PTZ remote cameras. PGM / PST Mode works as a traditional switcher complete with cross-dissolve switching and Aux bus delegation for sending different video to a secondary destination such as a presenter’s confidence monitor or additional presentation screens. Performance venues will benefit greatly from the built-in auto mixing function. The auto-mixing function automatically balances incoming audio sources such as microphones from a discussion panel, making it easy for the operator. The XS-62S’s audio processing also includes advanced effects such as EQ, dynamics and delay for mixing of vocal speech along with music and other audio embedded in video sources. These effects will provide improved sound quality for streaming applications, recording and sound reinforcement. The XS-62S is also suitable for live streaming and web conferencing systems. In this type of application, you could be using multiple PTZ cameras and PCs. With the XS-62S this can easily be operated by a small team or even a single person. PTZ camera control eliminates the need for individual camera operators, since everything can be controlled from the XS-62S while video is being switched by the same operator. The XS-62S’s audio capabilities make it easy to connect 4 microphones, mixing audio from computers and other video sources. *In order to do Live streaming with the XS-62S, will need to add an encoder device with an SDI or HDMI input, from a 3rd. party supplier. The XS-62S video switcher can seamlessly switch 6 inputs including 3G-SDI, HDMI and Analog (RGB, Component and Composite) sources along with 2 still images stored in internal memory. Three video switching modes can be selected, allowing a wide range of applications from the XS-62S. The professional broadcast quality crosspoint buttons are back lit with brightness control for use in bright daylight or dark performance spaces. A dedicated menu screen and volume knobs for adjusting audio are both easy to access from the front panel . The XS-62S is designed for direct control and intuitive operation for any events. PGM/PST Mode operates as a traditional video switcher complete with video compositions that enable grouping multiple images on one screen. You can create compotitions by combining DSK for layering titles and graphics as well PinP inset of video. Compositions can be previewed before sending to Program on the Preview output and can be sent to Program by pressing the TAKE button. PGM / PST Mode also has an available AUX bus making it possible to output different video from the PGM bus and PST bus to an additional destination screen. Video switching and composition with cross dissolve to the PGM bus are possible in Dissolve Mode. Disolve Mode is easily operated from the front panel and is suitable for a system where the user directly operates the main unit in a meeting space or event. The AUX bus is also available in Dissolve Mode, making it possible to output different video from the PGM bus and PST bus. * PST bus output is the same as PGM bus output. Individual video input signals can be output to three different destinations on three buses. This mode is effective for routing signals and is ideal for events and using multiple screens. Switching the video is with black flame. In addition to traditional Square or Rectangle shapes, the PinP function can select Circle, Heart or Diamond shapes. With the DSK function, you can overlay titles, lyrics, logos etc on top of composited video. Both luminance key (black / white) and chroma key (blue / green) fucntions are available. The XS-62S features a 18-channel audio mixer which includes four TRS jacks, RCA stereo Pair, plus audio de-embed from the six video inputs. The XS-62S powerful preamp and dynamics effects include a high-pass filter, gate, compressor, 3-band EQ, delay and ability to select audio follows video channel so audio passes through when a specific video source is selected. Dynamics can be adjusted from the onscreen menu or accessed through the powerful Remote-Control Software for Windows or Mac. The included Auto-Mixing function ensures the correct mix for multiple panel participants at conferences by automatically adjusting levels across all audio sources. A priority weighting assignment that is channel specific can be set giving the moderator or priority audio channel a higher volume level while using the Auto-Mixing function allowing the operator to focus on video switching and production. Assign up to eight analog audio inputs a separate audio embed channel on SDI 1 and 2 outputs to ensure a separate mix pre-effect (dry) or post effect (wet) for correcting audio problems post live event. This feature is additionally useful for multi-language events to record the voice-over or language translation on its own audio channel its own audio channel to a separate master. Roland's unique and proprietary wireless tally system uses a wireless LAN router connected to the XS-62S to send tally information iOS or Android devices on the network. Achieve multiple camera angles for fixed installations by controlling up to six PTZ cameras using VISCA protocol. Save and recall seven position settings for each camera. An easy-to-use software application XS-62S RCS for Mac or PC provides setup and control information for the Roland XS-62S through a network port. Copy, store and recall memory (backup) and preset settings. The XS-62S is equipped with an RS-232 and LAN port for control and operation remotely from a touch panel or other programmable interface device. * Select either HDMI or RGB/COMPONENT or COMPOSITE for the INPUT 6 connector. * Select either MULTI-VIEW or SCALER for the HDMI OUT 3 connector. (*1) Output refresh rate is 75 Hz when frame rate is set to 50Hz.